Ossington has been buzzing for quite some time now, gaining more and more popularity as the days go on. New to the neighborhood is Oddseoul, coming to you from the brothers behind Swish by Han. This Korean meets American no reservations restaurant means business. On any given night you can find a line up out the door waiting for a table in the 40 seat gem. The dishes are small, meant to be shared, and quite reasonably priced. Dinner for two including beer can easily come in at around $50. First on our list was the spicy scallion and avocado slaw. To be quite honest, I was a little disappointed when it arrived. 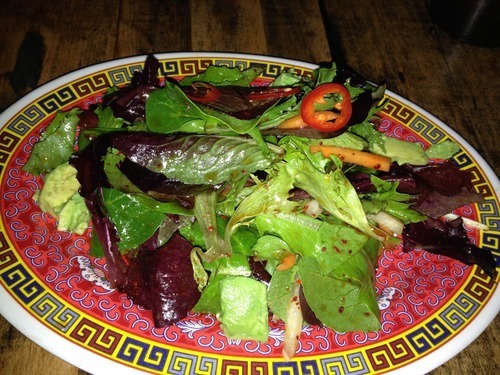 It was greens, a couple slices of avocado and a few circles of hot peppers tossed in a tangy vinaigrette. Not exactly my idea of a slaw. It was tasty, just nothing to get excited about. 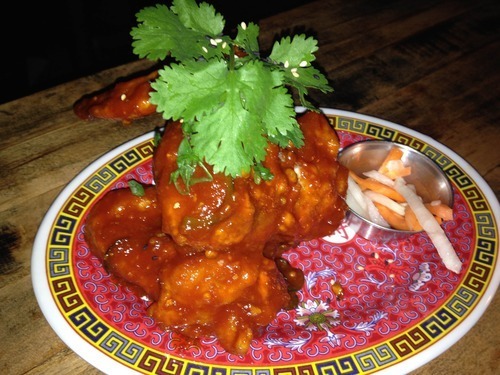 Next we were graced with large spicy Korean chicken wings doused in extremely hot gochujang barbeque sauce, but still with enough crunch to satisfy. The next 2 dishes were OH WOW YUM YUM!! 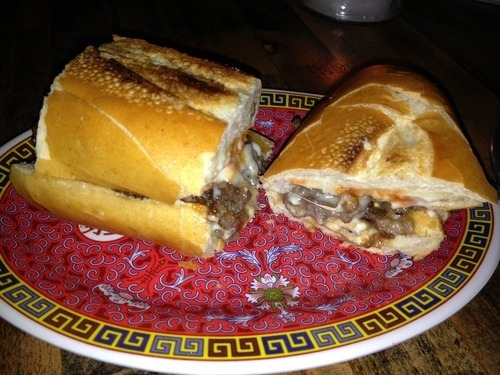 The Han brothers grew up in Philadelphia, so they decided to take their own spin on a Philly Cheesesteak. Take a baguette, stuff it with bulgogi (soy sauce, sugar, garlic, sesame seeds) marinated shredded beef, grilled onions, white American Cheese, kimchi, and a creamy mayo-mustard sauce. You don’t even know how delicious this creation is. However, there was some competition with their very own take on the hamburger, “The Loosey”. 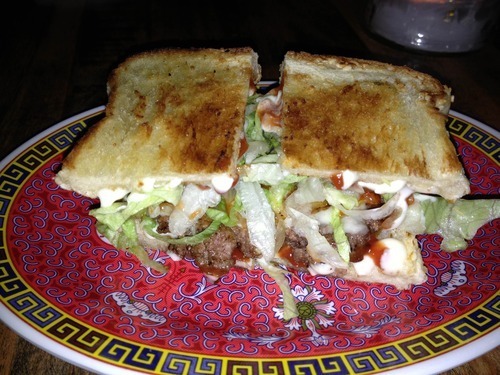 A mixture of short rib and brisket are slapped between two buttery pieces of challah bread, topped with processed cheese, shredded lettuce, ketchup and mayo. They are seriously giving the Big Mac a run for it’s money. I haven’t decided whether I prefer the bulgogi or “The Loosey”, because they are both shockingly flavourful, so I will continue to order both. Since the dishes are small, we were not finished yet. Our next choice was the tempura shrimp, tossed with Japanese chili paste, Japanese mayo called Kewpie, and flying fish roe. 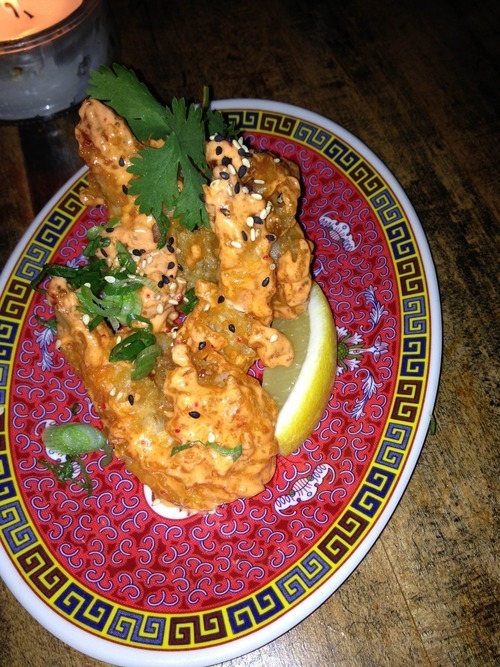 The tempura batter was thick and crispy with a generous coating of sauce. 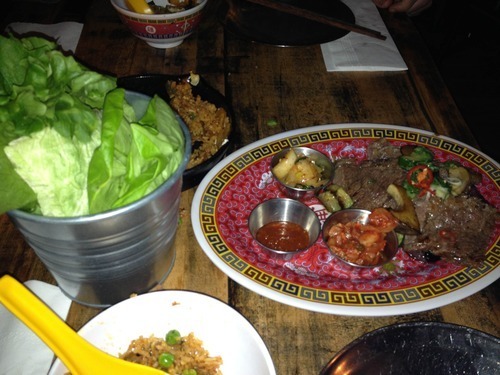 Lastly, the Korean beef Ssam platter arrived, which were ultimately Korean lettuce wraps. The menu offers a choice of meats, condiments and wraps (lettuce, tao or rice paper, depending on your choice of filling). We chose the Beef Short Rib platter which was accompanied by lettuce for wrapping, housemade pickles, kimchi, and bean curd chili sauce. 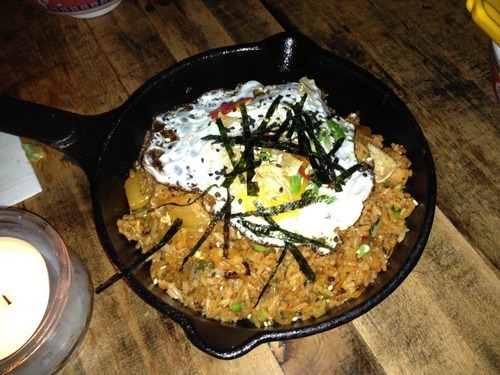 This dish is also served with Kimchi fried rice with an egg over top. The serving of rice was quite generous, and the flavour was explosive. The entire meal was an exciting, unique journey for my taste buds. We did try to revisit Oddseoul again but unfortunately it was an extremely long wait. I do plan on going back again soon though, and it is well worth the wait. © Copyright Sweets & Meats 2019.